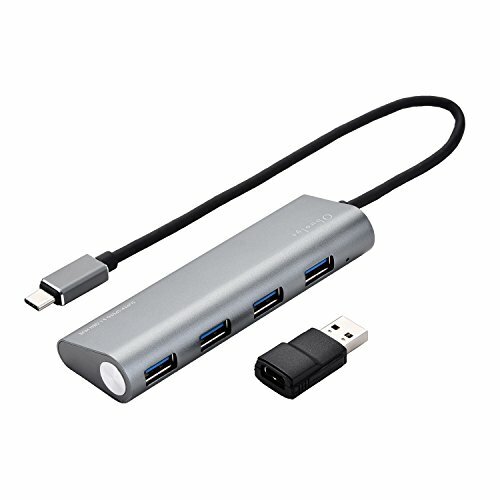 This Obuolys 4-port USB 3.1 hub transforms one USB type C port into four USB-A ports, enabling 4 devices with USB-A port working simultaneously through 1 USB type C port. All 4 USB-A ports support USB 3.1 Gen 1, with max data syncing rate up to 5 Gbps, 10X to that of USB 2.0. It works on most of the USB type C devices in the market.Obuolys is dedicated to provide products of premium quality. We monitor the full supply chain, from raw materials, components, to manufacturing processes, to ensure the quality of the end products. Every item bearing the name of Obuolys has to be thoroughly tested before it is packaged and shipped. If, however, for any reason you are not completely satisfied with our products, you may request a return within the first month, and we will refund you in full. 1 USB-C to 4 USB-A: Transform one USB type C port into four USB-A ports. SuperSpeed Data: Fully support USB 3.1 Gen 1, backward compatible with USB 2.0 and USB 1.1. Data syncing rate up to 5Gbps. Supports bus-powered (without power adapter) and self-powered (with power adapter, 5V 12A, power adapter not included) modes. Compatible with Mac OS X 10.7 or later, Windows 7/Vista/8/10. Sleek and Sturdy: Enclosed fully by high-quality Aluminum case, solid, portable, while provides enough space for 4 USB equipment plugged in simultaneously. Note: The 4-port USB hub may not work in proximity with wireless devices running at 2.4 GHz such as wireless mouse, some WiFi routers, etc.. It is a common problem for almost all USB 3.0 hubs. Please also note this USB hub needs extra power supply (power adapter not included) to support high power-consuming devices or charge your phones in quick-charge mode. If you have any questions about this product by Obuolys, contact us by completing and submitting the form below. If you are looking for a specif part number, please include it with your message.